YMAC is seeking a talented and committed Information Management Officer to join our Legal and Research team of professionals working closely with our Lawyers and Anthropologists on work in relation to filing and digitising of legal and research materials, a key project in relation to the return of research materials (RoRM) projects and organising, locating and accessing research material. The work will also include assisting in relation to the return of legal materials. It’s that time of year again when the YMAC Spatial Team hand out the annual ‘Clive Poole Spatial Excellence Award’. 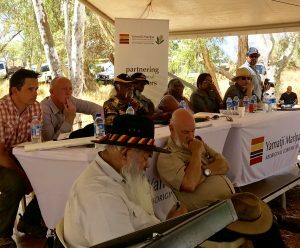 This award honors and remembers Clive who joined YMAC from the National Native Title Tribunal in 2012. He had an enormous impact on how spatial data was viewed, managed and used in the department. Prior to 2012, YMAC had no dedicated spatial information officer so Clive had a massive job organising and cataloging data, setting up spatial systems and processes, and educating staff about spatial data, its use and the benefits it can bring to the workplace. 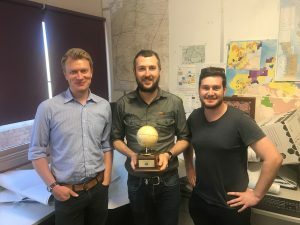 Each year the YMAC Spatial Team presents the award to a staff member in recognition of their commitment, willingness and enthusiasm to learn about all things spatial. There’s been a lot of strong competition this year (and many excellent QGIS analysis and maps produced). After much deliberation, the YMAC Spatial Team have chosen David Taft, Claim Lawyer based in the Geraldton office, to receive the award. Congratulations and well done David!